Prague – Total Central and Eastern Europe (CEE) mobility market revenue growth will remain flat year on year in 2017, according to the new update to the Worldwide Semiannual Security Spending Guide from International Data Corporation (IDC). The total CEE market value is expected to exceed $59 billion in 2021. The mobility market in the region will remain stable, with spending mostly driven by the consumer segment, especially by sales of mobile connectivity services and smartphones. On the other hand, enterprise hardware spending revenues will be mostly fueled by investments into notebooks. Enterprise mobility software will be the only technology segment to post notable revenue growth over the forecast period, with a compound annual growth rate (CAGR) in the low double digits. "Mobility plays important role in a digital strategy for an agile business, competitiveness, and greater customer engagement," says Dusanka Radonicic, senior research analyst with IDC's CEMA Telecoms & Networking group. Mobile application development services will post significant growth with the introduction of new models and technologies, particularly DevOps practices, design thinking, and automation. "The market is shifting from selling devices to selling experiences, and demand for physical devices is losing ground to securing and enabling apps and content across multiple devices," says Radonicic. "security approaches will become more stringent as enterprises implement digital strategies and the focus increases on protecting mobile apps, content, and access to corporate resources in a cloud environment." In terms of industry verticals, manufacturing, retail, and banking will represent the highest total mobility investments. Government will record the fastest spending growth, with a CAGR exceeding 5%. From the country perspective, Russia is the main contributor to mobility spending in the CEE region, accounting for approximately one-third of investments in 2017. This share is expected to slightly increase over the forecast period. The CEE market is not expected to undergo any dramatic changes, and those that do occur will be mostly driven by external factors, such as legislative changes (i.e., the law on electronic registration of sales in the Czech Republic) or funding surges from local governments or the EU in particular countries. 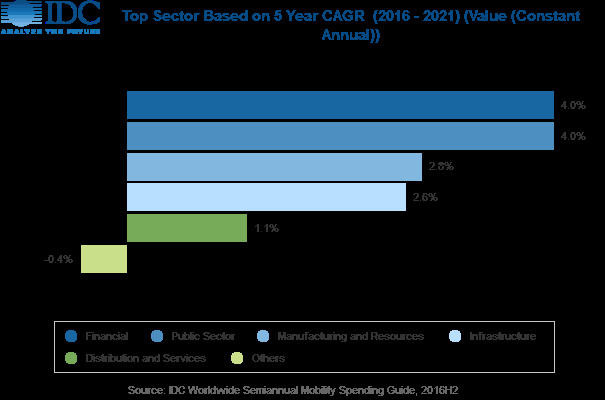 IDC's Worldwide Semiannual Mobility Spending Guide is designed to address the needs of technology organizations assessing the mobile opportunity by country, industry, and company size perspective. The spending guide provides subscribers with spending data on seven technologies across 19 industries, four company size bands, and 53 countries. Unlike any other research in the industry, the comprehensive spending guide can help IT decision makers to clearly understand the industry-specific scope and direction of mobility spending today and over the next five years.